M.S. I’m good bro, just training and getting ready to fight asap. In your last fight, you got a big win over former title challenger Alex Leapai. How does it feel to get back in the win column and what has this victory done for your career? M.S. Yeah the Leapai fight was good especially since I defeated him in his own country, but it felt good man. On to the next. Deontay Wilder was the last man to defeat you and he now holds the WBC belt. What did you think of Deontay’s performance against Bermane Stiverne? M.S. Good man. I thought Deontay fought a masterpiece and beat the s*** out of Stiverne for 12 rounds. Is a rematch with Wilder at the top of your list, or would you prefer a fight with Klitschko instead? M.S. A rematch with Wilder is something that I would love but at the same time he’s the champ right now and I’m willing to earn it and fight whoever I need to defeat to get that rematch with Wilder. While you wait your turn for a title shot, I hear you are looking to get a fight with Antonio Tarver done. There has been a lot of trash talk going on in social media and such. What’s your beef with Tarver? M.S. Man, Antonio Tarver is a prostitute in the heavyweight division that’s trying to hop on the first d**k that can get him a big payday. I told this dude to have Al Haymon send me a contract so we can rumble and he just start taking shots at me publicly so I had to verbally humble him and I can’t wait to get him in the ring to physically humble him. This clown yells into the camera after he beat Banks “Who’s Next” now that I’m yelling back “I’m Next” he has a bunch of cherry picking-a** excuses. Whatever respect I had for Tarver I lost all of it, now I don’t like him or respect him at all. 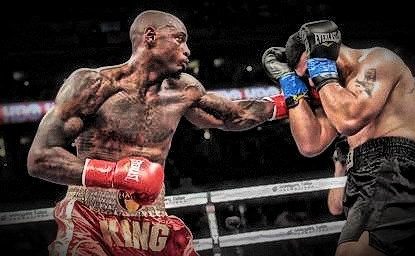 What have you seen in Tarver’s heavyweight performances that you think you can exploit? M.S. I don’t think s**t of it. Besides, he fought a couple of journeymen and now he has the audacity to think he should get a title shot. What a f**** joke! What Tarver did at light heavyweight was cool but as a heavyweight he hasn’t done s*** so f*** him. Do you see anything in Tarver’s style that could pose any threat to you Malik? M.S. This Milk Dud-head a** clown walks around with a stomach of a 9 month pregnant woman and is trying to piggyback his way to a title. That won’t happen if Malik Scott has anything to do with it. His feet are in the mud and I’m just ready to put him out his misery. Any final thoughts for the fans Malik? M.S. If you’re marching with me on my road of redemption I love but if you’re not then f**k ya, Peace.